I love travelling the globe and am lucky enough to have visited many stunning destinations. 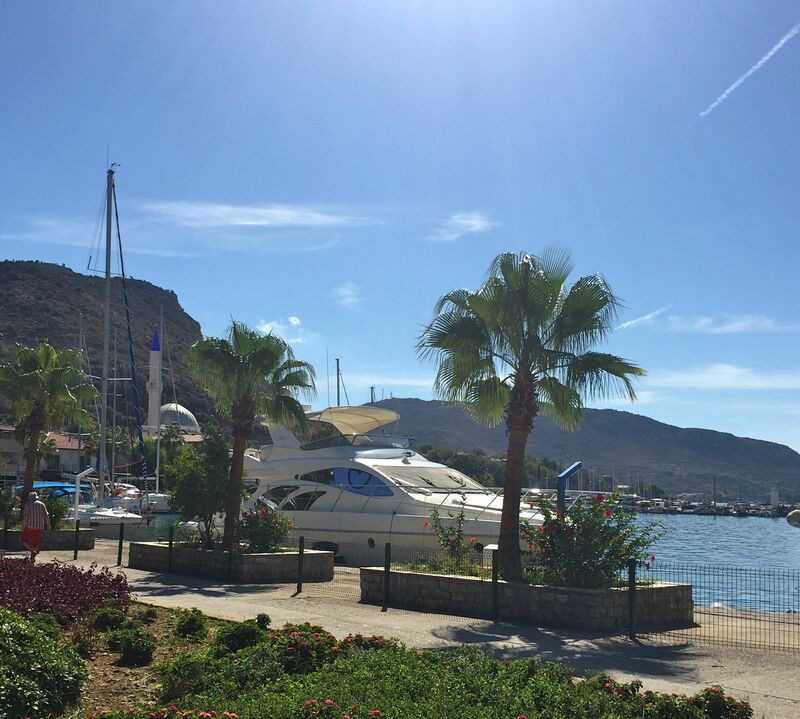 I was very excited to be heading for Rhodes in Greece to embark on my Mediterranean Delights Fitness Voyage around Greece and Turkey. Travel can come with its downsides though. Like being delayed 17 hours at Gatwick Airport! This involved eight hours sitting on two planes on the runway for a raft of reasons before being herded back into the airport for a night in the (very nice) Hilton Hotel and an early morning wake up to try all over again. Tedious to say the least. This did have the positive effect of making my eventual arrival in Rhodes even more joyous. Due to the shocking weather our voyage was delayed, too, and I explored this beautiful town in a torrential downpour. 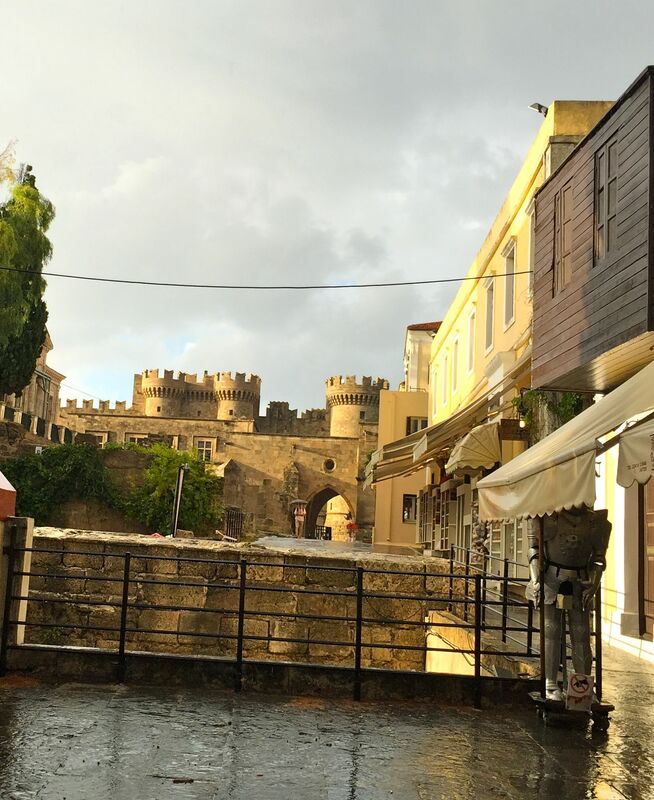 Rhodes Old Town is a charming place packed with history and lots of great shopping and eating opportunities. Even in the rain! 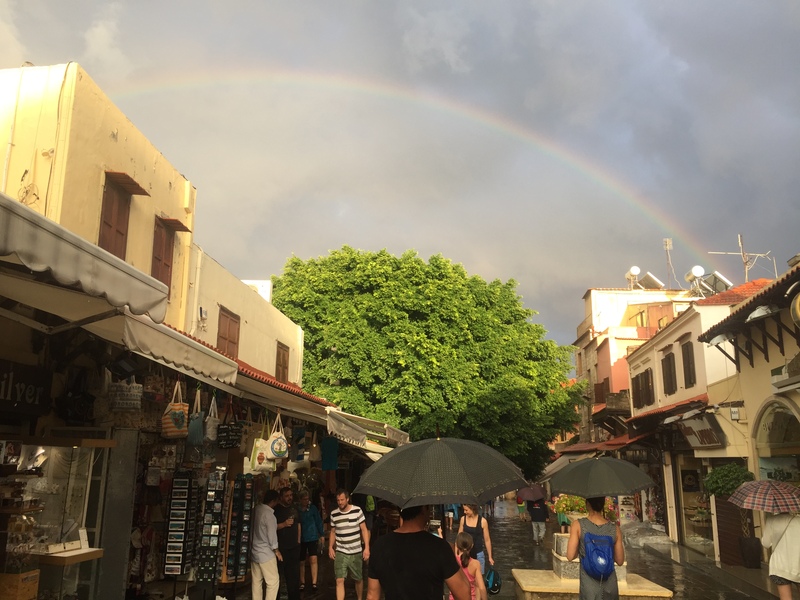 And every cloud has a silver lining – or in this case a rainbow! I was told that Rhodes supplies a lot of the country with water, so the rain was a good thing – and having grown up on the farm I get that. But I was pleased when it stopped and we could embark on our adventure, early the next morning. 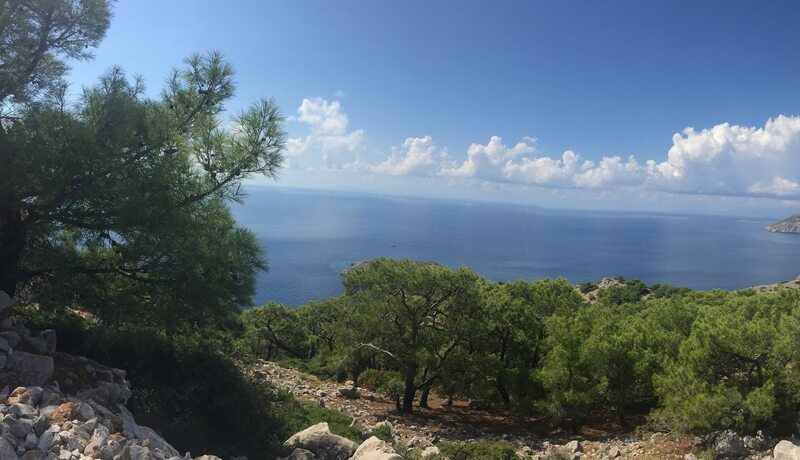 Our beautiful Turkish gulet was heading for the Greek island of Symi. First stop the Panormitis monastery. No one seems definite about exactly when everything was built but it’s thought the church was constructed around 450AD over the site of an ancient temple. It stands on the left of a beautiful courtyard and is dedicated to the Archangel Michael. Tradition has it that if you ask a favour of Archangel Michael (and loads of people do), you must give him something in return, so the little, elaborately decorated church is packed with an array of gifts. 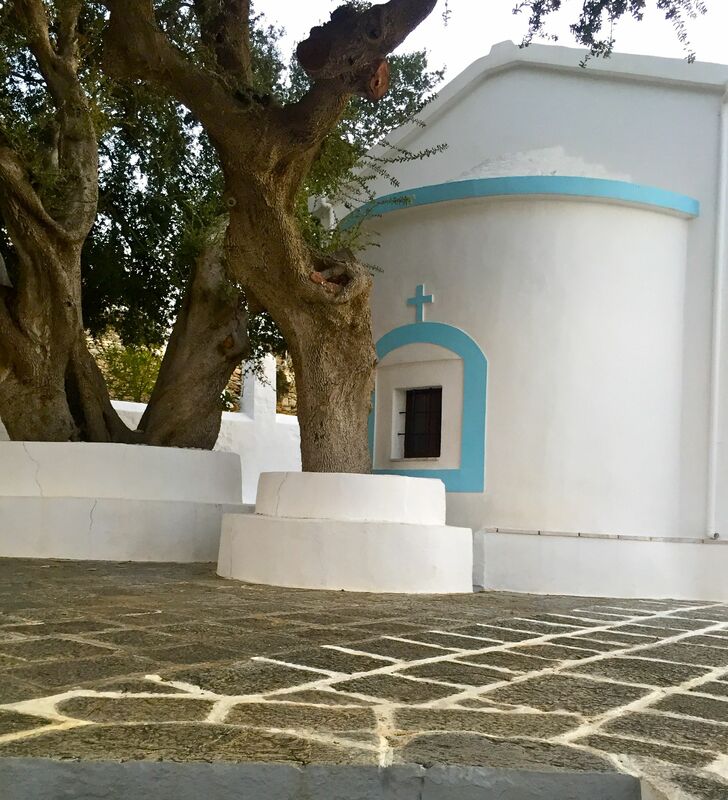 Rooms are available to rent in the monastery, I’d imagine it’s the ideal place to get away from everything and enjoy some peace and Greek sunshine by the sea. Explorations complete, it was time to embark on our first hike. Right up to the top of the hill. 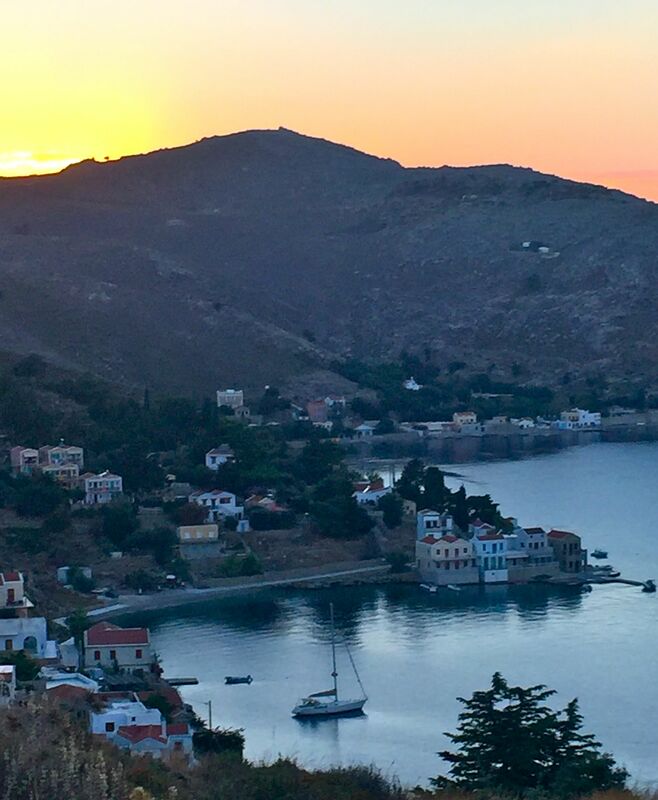 There’s a herbal aroma like no other in Symi with wild sage aplenty, hints of oregano and thyme and the refreshing scent of fresh pine needles. We breathed in the heady cocktail as we ascended higher and higher with a widening panorama of blue to feast our eyes on. The hike was a good work out but nothing too taxing with a wide, beautiful and somewhat wild path to follow. It felt like we could be the only people on top of a beautiful world. What a perfect first morning. There are endless photo opportunities on this trip, perfectly encapsulated here as we all stop to snap away at each other, the views and even ourselves. We sailed every day, but never very far. Another cove in Symi revealed steep cliffs, a little beach, another monastery (tiny this time) and plenty of goats nimbly descending precipitous slopes. I’ll always feel a sense of happiness when I hear the tinkle of goat bells again. 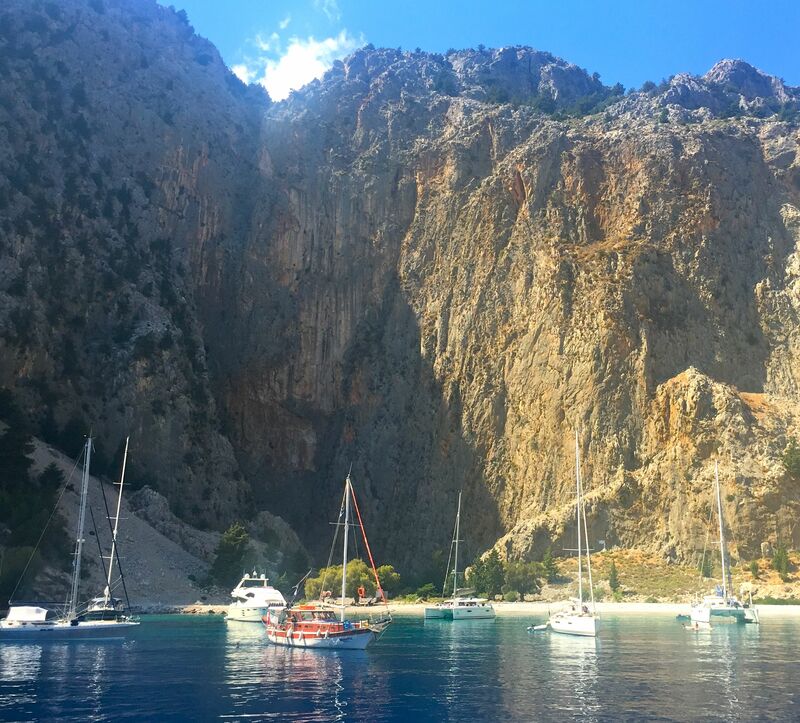 Daily stops varied from us being the only boat in sight enveloped in the most beautiful peacefulness you could imagine to harbourside mooring in lovely seaside towns. The perfect combination of get-away-from-it-all relaxation and happy exploration with welcoming locals, bustling bars and restaurants and amazing shopping opportunities. 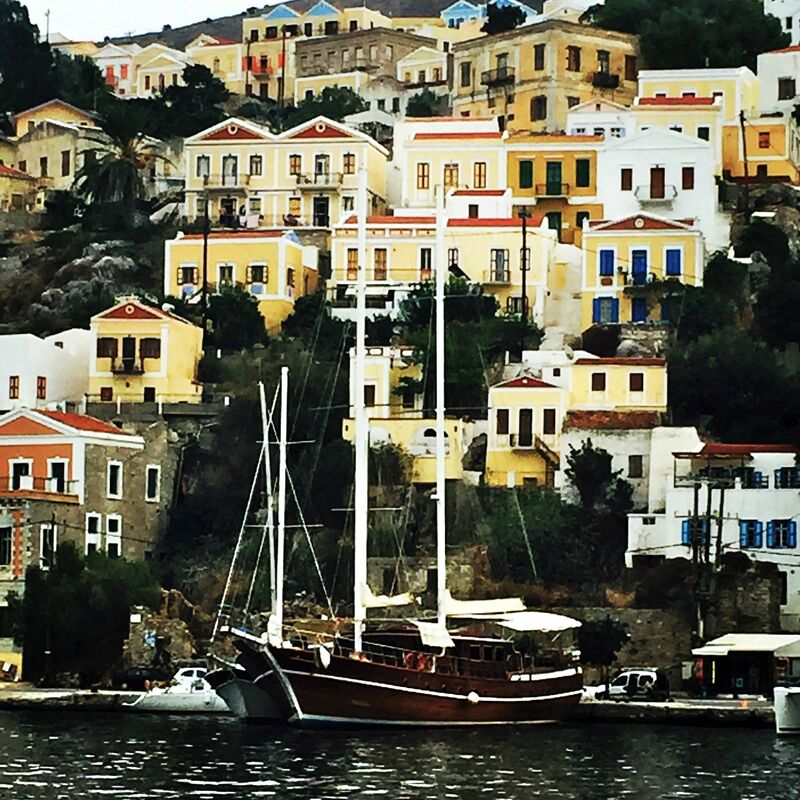 I fell in love with Symi Harbour instantly. I mean, do villages get more beautiful than this? With herbs growing aplenty it wasn’t surprising to find the most wonderful array on sale. Here’s Stavros’s stall, a real treasure trove of delights sold with a smile and a chat. Great value too, I bought a big bag of the most aromatic oregano ever and some herb tea that I’ve been drinking copiously since my return home. 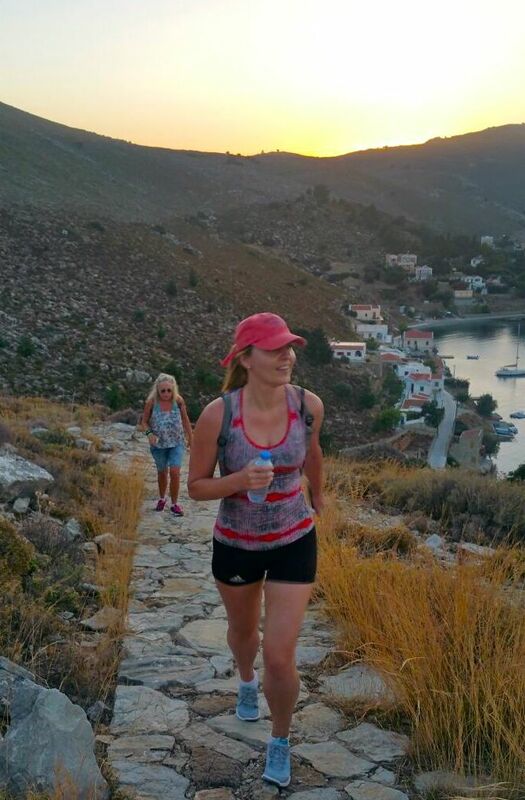 Our second hike of the trip, just before sunset, took us around the side of the harbour, up a stone path to the very top and another picturesque monastery. 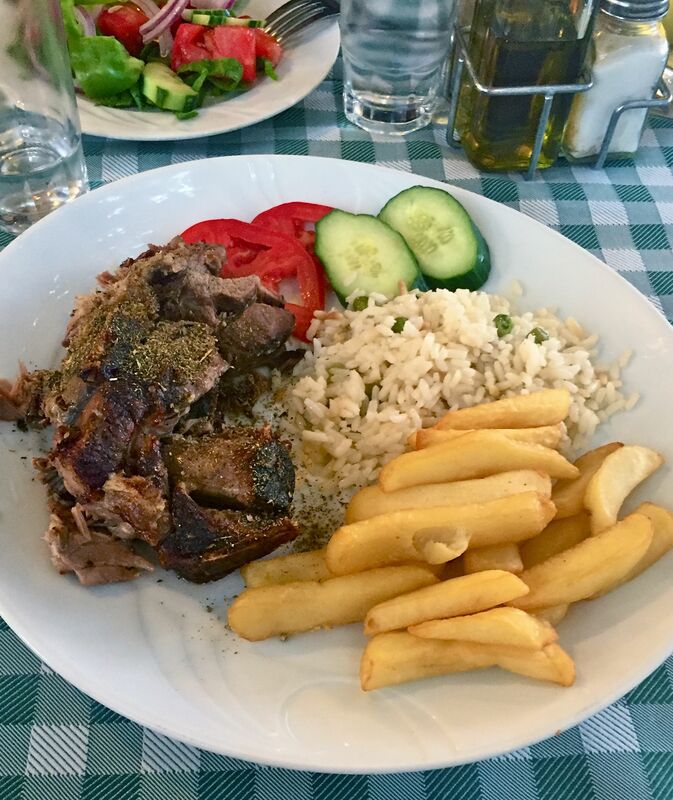 Symi’s where Rick Stein did his cooking in his recent TV series, From Venice to Istanbul. I have a great job, but I’ve got to say, his has to be better! As I watched the series avidly I recognised the town and felt immediately at home in it. It’s the perfect holiday spot, one that I hope to visit again for a longer stay. I quite liked the Retsina with its earthy, somewhat weird taste. I’d describe it as kind of like a cross between Grappa and wine. Nothing wrong with that. 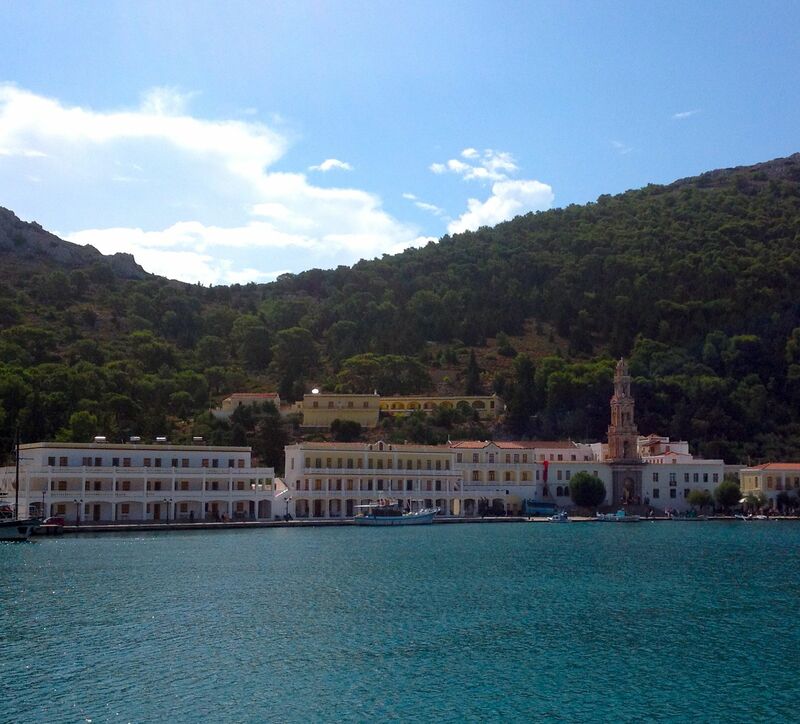 This was our last stop in Greece, a couple of hours sailing across the bay and everything felt very different. 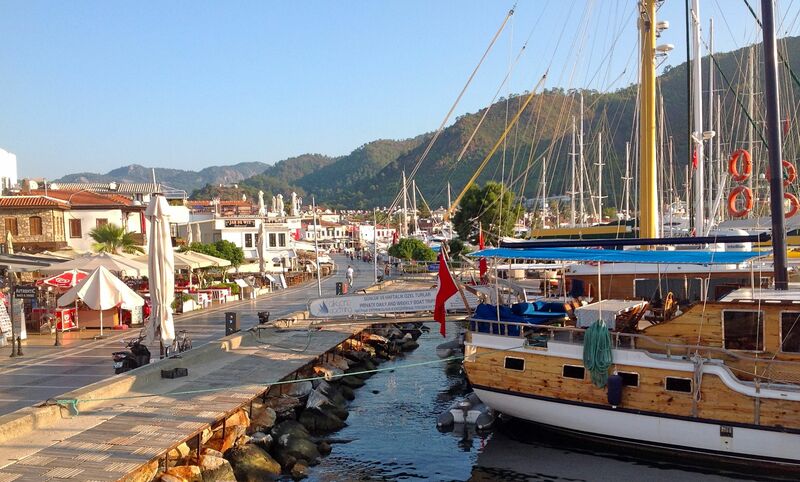 Welcome to Turkey and Bozburun, another seaside port with its own unique charm. And amazingly welcoming, friendly people. 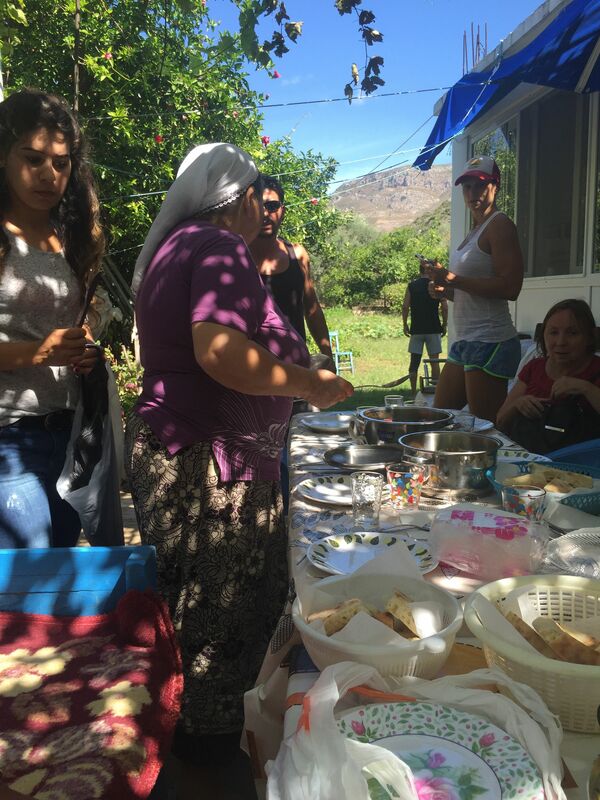 We were even invited to a local home for lunch. Now that’s friendly. 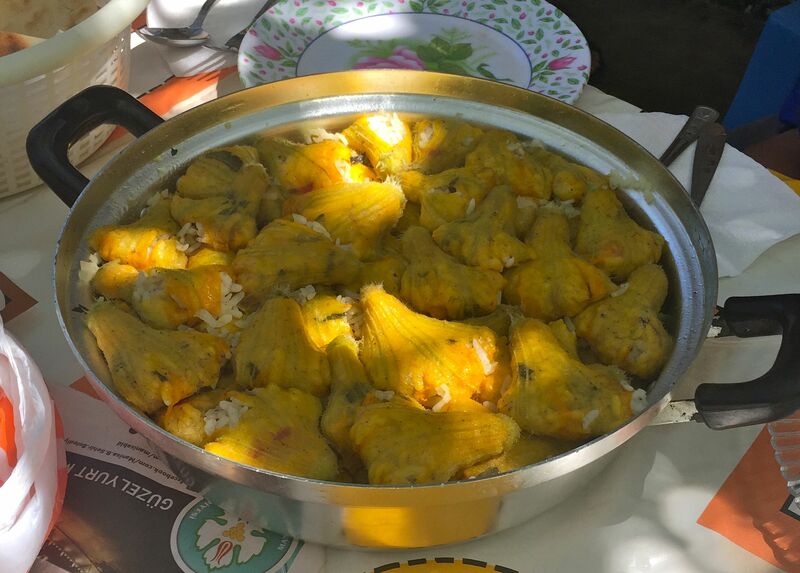 A meander up the hill and we arrived to a table set under the trees laden with a delicious home-cooked meal. 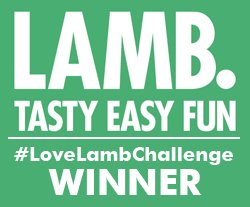 This beautiful dish of pumpkin leaves stuffed with tasty, savoury rice was a real labour of love…and it tasted like it. 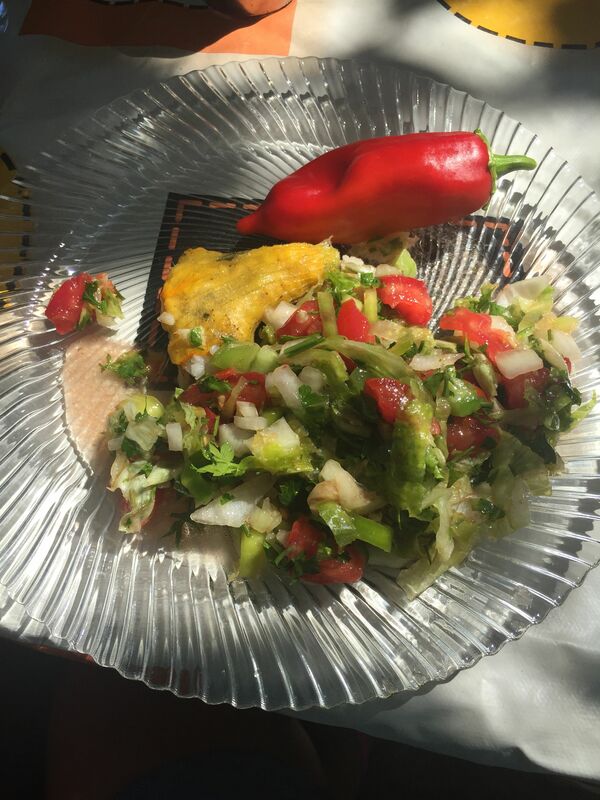 We were also presented with large chillis picked straight out of the garden, a beautifully fresh salad and a big bowl of aubergines cooked with tomatoes and garlic. All produce straight out of the garden a few metres away. Just fabulous. A post-lunch wander back through town to our boat home and it was out into the wide blue yonder again and away from civilisation into a perfect azure cove for the night. 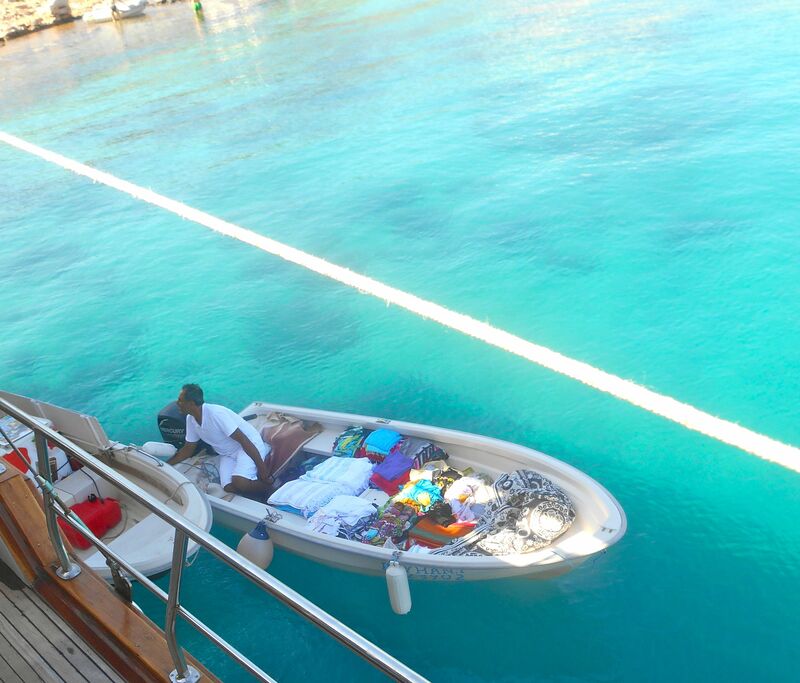 We hadn’t been anchored for long before shopping opportunities came to us. My first experience of boat shops…an ice cream man, a load of beautiful towels and linens and even freshly baked bread first thing in the morning. As we headed towards our final destination, Marmaris, we stopped off opposite Paradise Island for a final dip in the ever-warm sea. How I miss that sea. 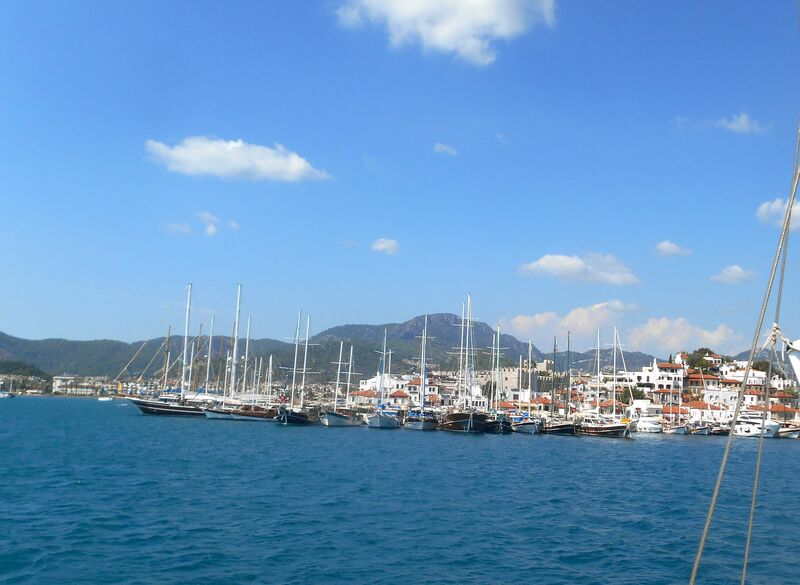 The final sail of the week and we headed into Marmaris Harbour. From my favourite spot on the top of the boat (officially know as the sunning area), all set to the tones of Johnny Cash (a boat tradition apparently) which somehow seemed to add an extra poignancy – and ultimately a couple more songs to my iPod. 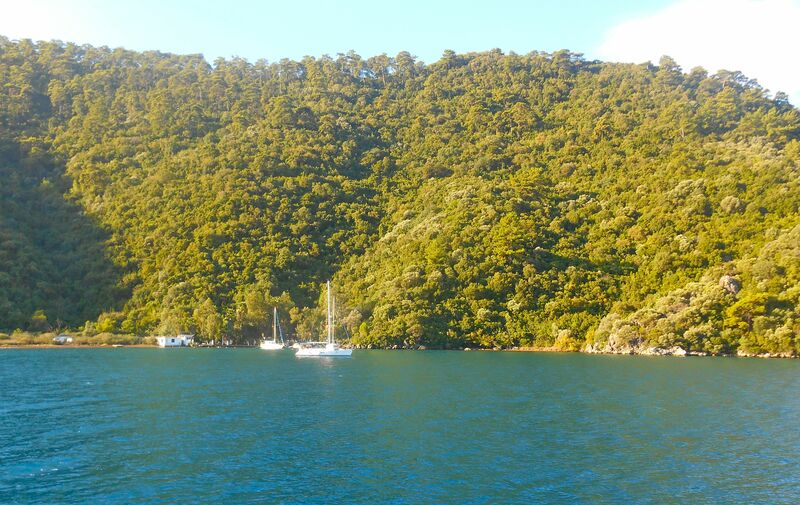 Here’s the view from our final mooring of the journey in Marmaris. An amazingly buzzy holiday town, with the front coast-facing road packed with a cornucopia of restaurants offering delicious Turkish fare. And there’s Bar Street running parallel behind it, no confusion as to what happens there. I loved the Grand Bazaar (a smaller less hectic version of the one in Istanbul) with an exotic mix of spices, souvenirs, clothes, bags and pretty much anything else you could desire. All dotted with great food stalls and coffee stops. I could meander here for days and snapped up bags of chilli powder, sumac and dried pomelo. Great flavours to take home. 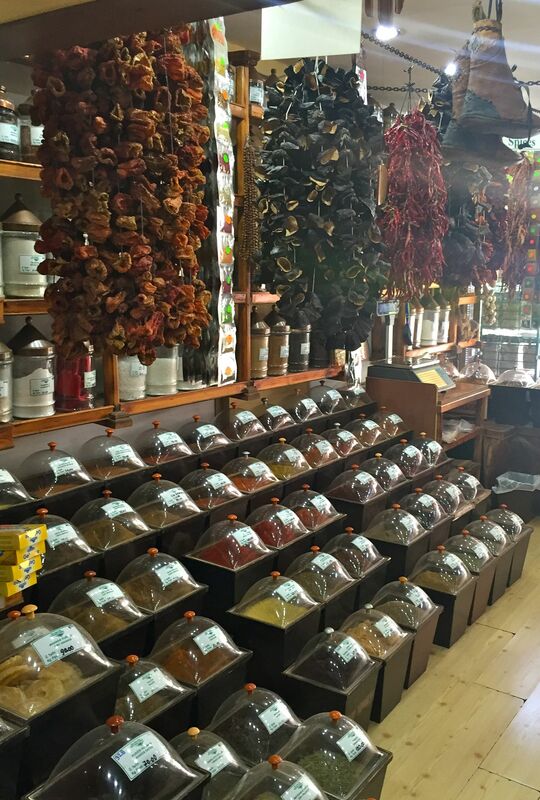 The greatest collection of spices and herbs I’ve ever seen in one place. 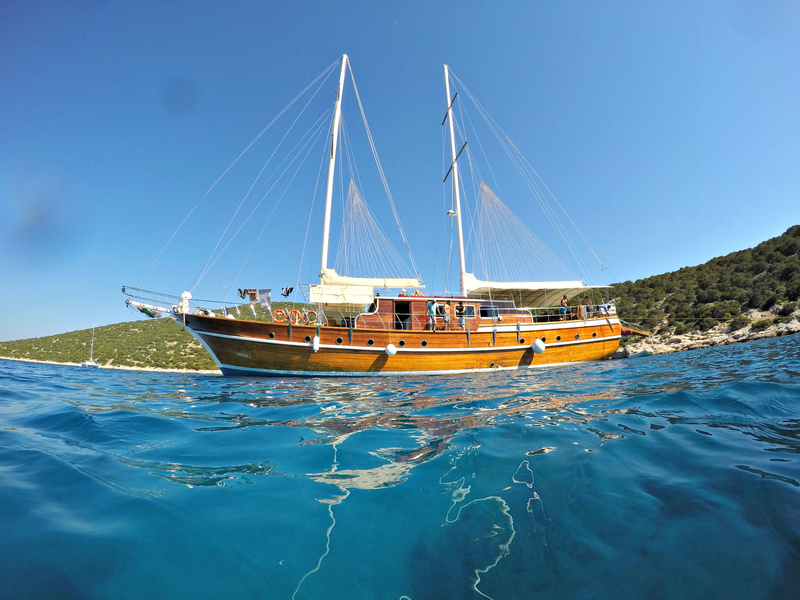 Here’s a final shot of our wonderful gulet the Muhtesem A. My home for a wonderful week and one I really didn’t want to leave. Voyage itineraries have to be a bit flexible, taking weather into consideration – as I discovered. Who’d have thought it could rain that much in one afternoon in Greece. 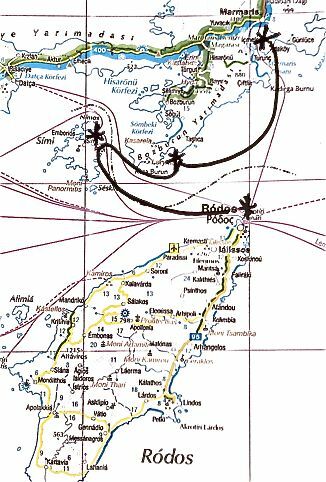 Here’s the map so you can get an idea of the geography. The stars denote Rhodes (our starting point, Symi, Bozburun and Maramaris (our finishing point). 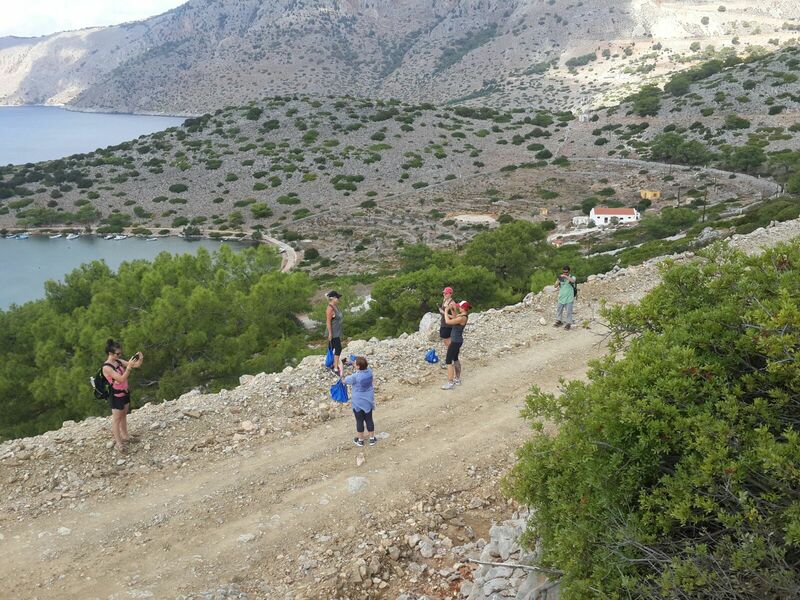 Find out more about Mediterranean Delights Fitness Voyages by clicking here. It’s a truly great way to explore this beautiful region. There are a range of fabulous trips available for 2016.